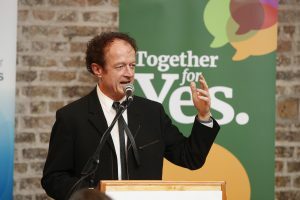 “This referendum result was won through the leadership of a powerful grassroots movement which fought hard to secure a referendum vote over many years, and which evolved into an effective and focused Together For Yes political campaign over the past few months. 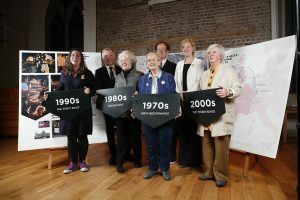 ICCL is especially proud of the role our members have played in fighting against this referendum since 1983 – including our founder Mary Robinson and our former Board members Ivana Bacik and Ailbhe Smyth. 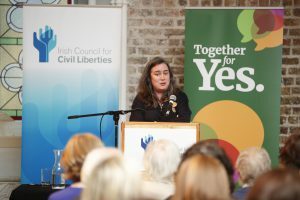 “We must also remember that women in Ireland face many other obstacles to full equality – including physical and sexual violence inside and outside the home; the gender pay gap, and underlying societal assumptions about women’s bodily autonomy. 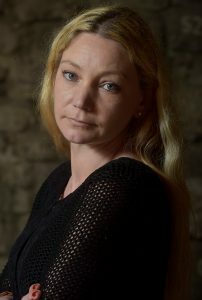 We only need to look to two very recent murders of young women for this to become all too apparent”. 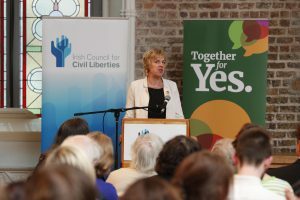 ICCL also recognises that this referendum campaign has disclosed wider issues about our political and democratic process, including restrictions on freedom of expression, the need for greater transparency regarding campaign financing, and a wider lack of clarity regarding how elections should be regulated in the digital age. 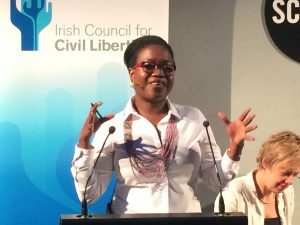 In the coming months, ICCL will call for a wider review of how Ireland addresses these complex issues and we intend to work with civil society partners to call for a review of the existing law in this area. 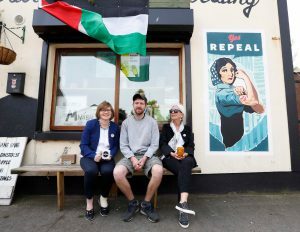 The Irish Council for Civil Liberties (ICCL) today unveiled a campaign mural calling for a YES vote in the forthcoming referendum at Bang Bang café in Phibsborough. 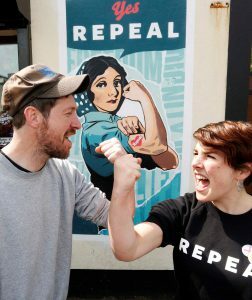 ICCL commissioned street artist and graphic designer Giant Sigh to create a mural, which draws on images of feminist workers’ icon Rosie the Riveter and Yeats’ and Lady Gregory’s cultural representation of Ireland Cathleen Ní Houlihán to highlight the importance of women’s rights and equality in today’s Ireland. 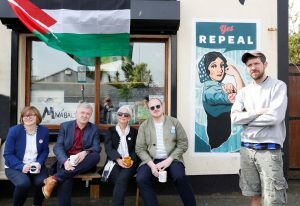 The mural unveiling comes as ICCL released a statement this morning on the increased importance of political and artistic freedom of expression in referendum contexts. 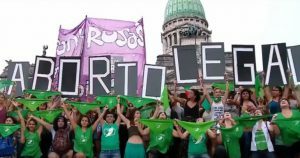 The statement was circulated widely in the arts community. 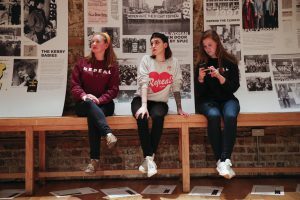 A number of speakers discussed the recent censorship of artists such as Grace Dyas, Una Mullally and Maser. 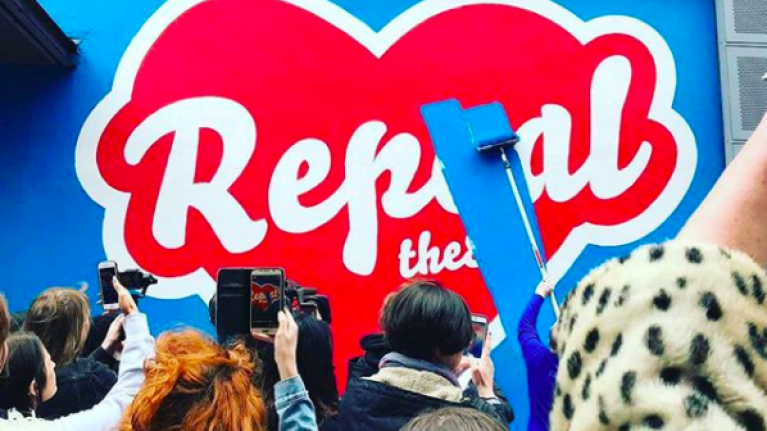 Liam Herrick, director of the ICCL, said: “We’ve been gravely concerned that artists are being prevented from exhibiting art during the pre-Referendum period because their art concerns women’s experiences of abortion and has therefore been deemed too “political” to be allowed. 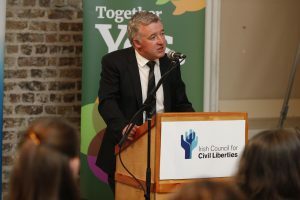 We have analysed court judgements such as McKenna and McCrystal in the light of European Court of Human Rights judgements and, in our view, it is imperative that the government facilitate, rather than shut down, artistic and political expression even when it does come down on one side of the debate”. 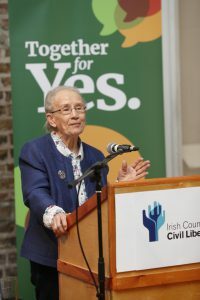 Orla O’Connor of Together for Yes wrapped up the event, saying “There are 7 days to go to the vote. 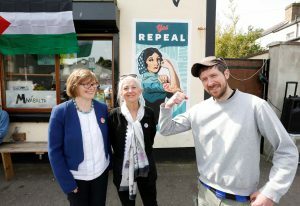 It’s time to take a stand and provide care and compassion for women in ireland. 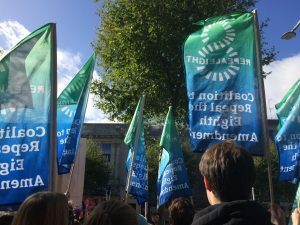 Abortion is a reality in Ireland when over 3,000 women travel to the UK and over 3 women per day take abortion pills. 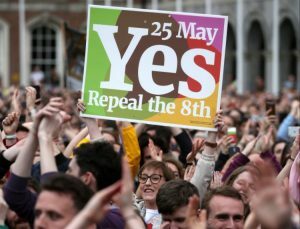 The decision that faces us on the 25th May, is do we want another century where women and couples have to endure extreme stress and trauma or do we want regulated, safe abortion where decisions are made between between a woman and her doctor. A representative of the SUBSET artistic collective spoke about their Grey Area Project and the crowd gathered also heard poetry from spoken word artist Lewis Kenny.